On March 31st, 2018, SeoSamba is releasing the annual Top 100 Retail Franchises Digital Marketing Performance Report. In this exclusive report, SeoSamba analyzes the latest trends, strategies, and challenges of digital marketing for franchising leaders of the retail products and services market. This research report will retail for $1,999 on On March 31st, 2018, but will be offered for free to the first 300 subscribers. The United States counts over 100,000 retail products and services franchise establishments, notwithstanding over 60,000 retail food venues. In 2017, e-commerce grew by more than 16%. The fastest growth since 2011! Can Franchise retail stores still compete in the e-commerce and mobile era? In this context, can brands still believe they can thrive without fully enabling their retail network for e-commerce and Mobile Commerce with a holistic marketing program? These are some of the many questions that find an answer in this new exclusive report analyzing data from top franchising brands. As with past years, the Retail Franchises Digital Marketing Performance Report shows that the more units in the franchise, the higher the chances are for franchisees to be featured on the franchisor’s main website. Bigger, more structured Retail Franchise networks still have a strong tendency to offer more online exposure to their franchisees. Over half of the smallest franchise networks (53.4%) do not put their franchisees in the spotlight. Conversely, bigger Retail Franchises (100 units or more) feature franchisees on their global website more frequently than last year (71.7% vs 64.3% in 2016). Mid-sized Retail Franchises (26 to 100 units) have also significantly improved on-site franchisee integration (78.4% vs 66% in 2016). What is the state of digital marketing for franchising retail brands? Can retail stores still compete in the e-commerce and mobile era? What solutions in each area, how do you compare to the best performing brands, and what competitive edge can you gain from this knowledge? The Top 100 Retail Franchises Digital Marketing Performance Report 2018 is released on March 31st, 2018, and is available for $1,999, but 300 early birds can get it for free today. 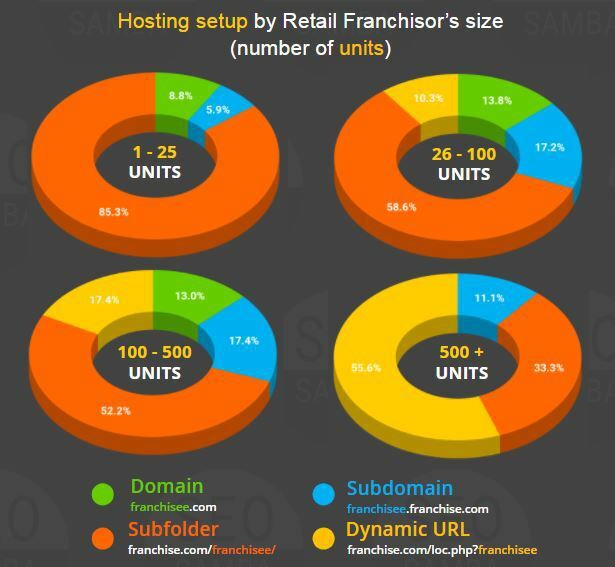 To get your free copy, go to https://www.seosamba.com/top-100-retail-franchises-digital-marketing-report-2018.html and be amongst the 300 first to fill up the download form!